On this day in 2009 we were travelling through Utah, on our way from Moab to Bryce Canyon. On the way, we drove through Capitol Reef National Park. We only had time for one stop, but as we drove through the stunning scenery of burnt orange canyon walls and rippling yellow grasses, we resolved to return. We stopped in the rather prosaically named Fruita, where the principal industry used to be the growing of, you guessed it, fruit. The top picture is Holt’s Orchard, in Fruita. In 1878, a small group of Mormons settled this land by the Fremont River. 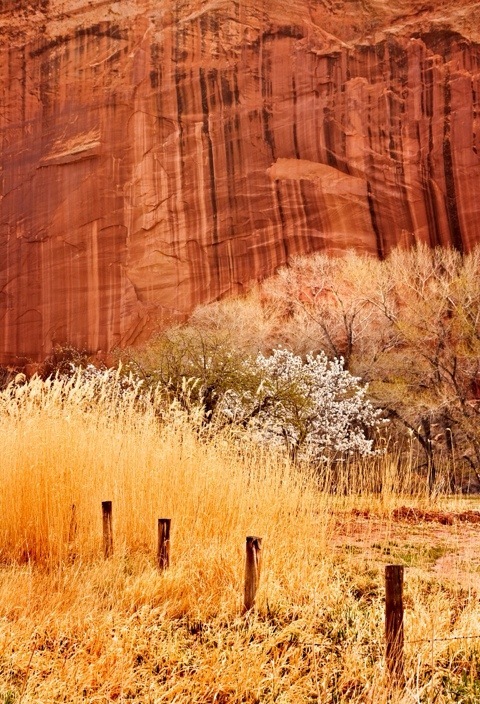 They found the climate suitable for growing fruit and, now run by the National Parks Service, the orchards continue to flourish today, the Spring blossom making a striking contrast with the imposing red walls of the canyon. Life was hard for those early settlers. This orchard was planted by the Holt family and a little plaque tells their moving story, from the death of their daughter at 3 months from a scorpion sting to the loss of their farm a few years later in one of the many devastating flash floods to which the area was prone. The Mormons were not, however, the first settlers of this area. Ancestral Puebloans farmed this land from 700 to 1300AD and, just over the road from the Holt Orchard, a boardwalk now runs along the canyon walls to make viewing possible of the many intriguing and beautiful petroglyphs that remain as evidence of their presence (see picture below). 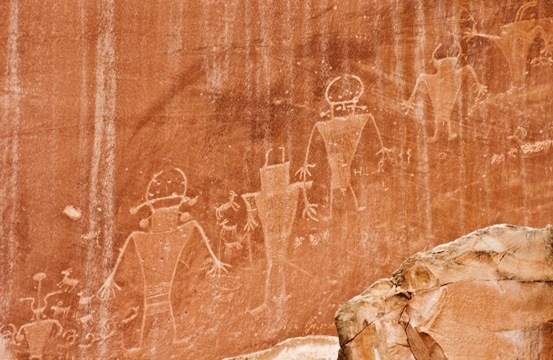 This entry was posted in photography, travel and tagged Capitol Reef, history, National Park, orchard, petroglyphs, photography, South West, travel, USA, Utah by Rachael. Bookmark the permalink. Lovely post Rachael, and as always such gorgeous photos 🙂 Off now to check out that blog! Thanks, Karen. It’s a super blog. I am sharing it with M as it’s quite inspirational for her to read about such a feisty, non-girly young woman. 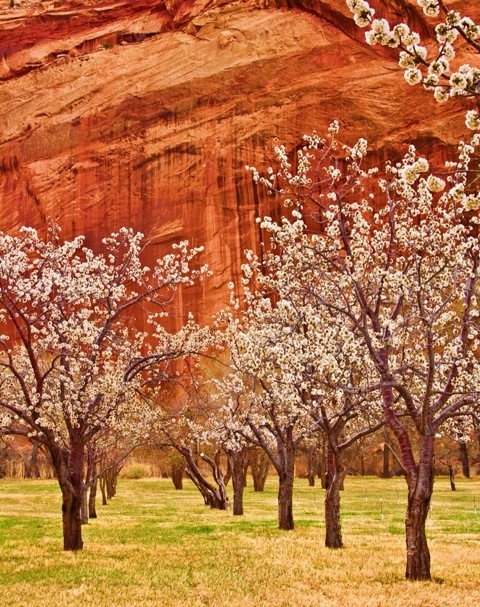 So nice to see these images from Capitol Reef. We visited in the fall some years back and one of my fondest memories of our time there is of picking apples off the trees in these orchards. It really provided a very concrete connection to the history of this place. Your orchard image is just splendid! Thanks! I would love to do that. We will definitely be returning to Utah some time in the next three or four years and perhaps it will be Autumn. If so, we will make that a ‘must do’. You have made so many interesting trips. Have you ever thought of writing a blog about them? Capitol Reef was certainly an unexpected treat in my Alaska to Florida trip in 2011. I didn’t know what to expect from it and was blown away by those fantastic orchids embedded within that deep red canyon. Your post makes me want to go back! It is a bit of an undiscovered gem, I think. We didn’t see any orchids when we were there. I expect it was too early; mid-April. Another reason for us to go back!